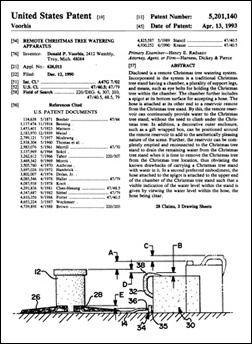 William Arthur Greenberg and Judson Daniel Evans received US Patent 6347479 on February 19, 2002 for a Christmas Tree Watering Apparatus. 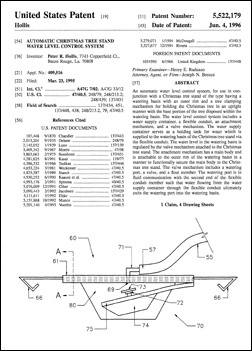 Peter R. Hollis received US Patent 5522179 on June 4, 1996 for an Automatic Christmas Tree Stand Water Level Control System. Keeping ornaments on the Christmas tree can certainly be a vexing task. Animals, kids, everyone is always conspiring to take down those glass balls. For those who want to decorate with flowers that is certainly a task involving much hair pulling. 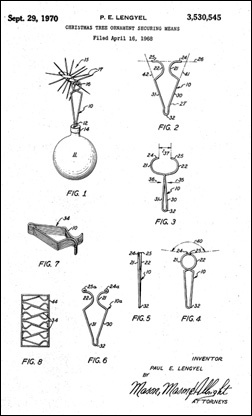 To help secure ornaments in a better fashion, Paul E. Lengyel received US Patent 3530545 on September 29, 1970 for a Christmas Tree Ornament Securing Means. For many years the conventional method of hanging ornaments on Christmas trees has been to engage a loop extending for the ornament by further loop at the end of a wire hook which is then hooked over a limb of the Christmas tree. Despite their simplicity, these hooks have certain drawbacks. A primary disadvantage lie in the fact that often the hook does not engage the actual branch of the Christmas but instead hangs on needles extending from the branch and may be easily disengaged by a slight movement of the tree. 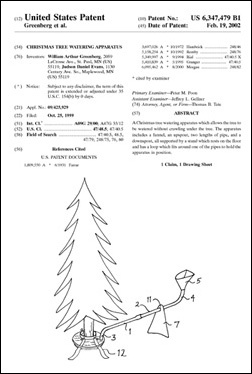 From those wanting to keep the fresh flowers on their Christmas tree, Ekkehart Gasper patented an Apparatus For Attaching A Flower To Christmas Tree. 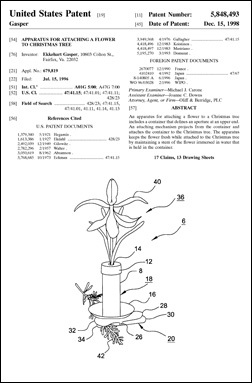 He received US Patent 5848493 on December 15, 1998. However, the problem arises that flowers placed along the branches of Christmas trees do not stay fresh very long. The flowers die and must be replaced frequently. This replace is tedious, time consuming and expensive. The industry lacks a device that attaches a flower to a Christmas tree which also keeps the flower fresh over extended periods of time. It is, therefore, an object of the invention to provide an apparatus and method for increasing the longevity of flowers attached to a Christmas tree. Or you can just skip all the hassles of a Christmas tree and just get one that you can eat. 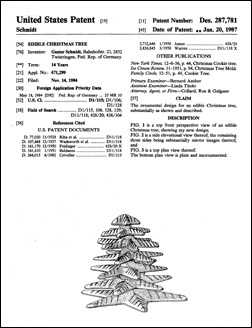 On January 20, 1987, Gunter Schmidt received US Patent D287781 for an Edible Christmas Tree. ← Invention Geek – Yellow Freight Logo?